In March, new HHS Secretary Dr. Tom Price said no Americans would be hurt financially by the House Republican bill to repeal and replace the Affordable Care Act. He predicted the number of people with insurance would increase. A few days later, during a CNN town hall event, Price defended the bill, which would phase out enhanced federal funding for the ACA's Medicaid expansion. He was confronted by Brian Kline, a Pennsylvania cancer survivor, who told Price the expansion "saved my life and saved me from medical bankruptcy." Kline then asked Price: "Why do you want to take away my Medicaid expansion?" The secretary responded that "we don't want to take care away from anybody" but that Medicaid has "real problems" and the administration wants to give people currently on Medicaid better coverage options. Price, a former orthopedic surgeon and seven-term congressman from the Atlanta area, has not shied from controversy in his first few months as HHS secretary, after being confirmed by a 52-47 Senate vote in February following weeks of bitter debate. Democrats opposed Price's nomination partly on the grounds that as a congressman he had traded healthcare stocks while pushing legislation that could affect those companies' share prices. Despite his travails, Price's leadership in shepherding the ACA repeal-and-replace bill through the House last month—and his expected role in overseeing the health insurance market, value-based payment innovations and Medicare physician payment reform—earned him the top spot on Modern Healthcare's ranking of the 50 Most Influential Physician Executives for 2017, his first time on the list. "He got a bill through the House, and it didn't look good before that," said Tom Scully, who headed the CMS under President George W. Bush and now is a partner at the investment firm Welsh, Carson, Anderson & Stowe. "A lot of people don't like the policies, but he's done a pretty good job on the policies he's been asked to carry out." One big challenge so far has been the Trump administration's slow pace in filling key positions at HHS and its subsidiary agencies, making Price's job even tougher. "They've done a pretty good job of getting people onboard, but they still have big positions to fill," said Bill Pierce, an HHS official in the George W. Bush administration who's now a communications strategist at APCO Worldwide. Earlier this month, Price took flak from congressional Democrats for defending President Donald Trump's budget proposal to cut hundreds of billions of dollars from medical research, Medicaid, the Children's Health Insurance Program and public health efforts. He countered that many federal programs "fail the very people they are meant to help." Some observers criticize Price for not pushing to ensure funding for the ACA's cost-sharing reduction payments for lower-income exchange plan enrollees. Insurers complain the administration's refusal to commit to continuing those payments is forcing them pull back from selling plans on the exchanges in 2018. "Price is part of the team that's causing a substantial amount of market disruption," said former Clinton administration official Dan Mendelson, now CEO of Avalere Health. Price was not available for an interview. Price hasn't moderated his strong conservative views from his years in the House, tirelessly tweeting out the argument that the ACA and excessive federal involvement in healthcare are hurting consumers, showcasing individual examples. On June 9, he pushed out a video clip of Mollie Hoskins Scarbrough, owner of Hoskins Drug Store in Clinton, Tenn., who said that narrow networks are hurting her small business. "Under Obamacare, coverage ? care. Another broken promise . . . one that's hitting Mollie's #smallbiz & others like it. Time to #RepealAndReplace," Price tweeted. He told Democrats earlier this month that he stood by his previous statement that "there are no cuts to the Medicaid program" in the House bill to repeal the ACA, even though the Congressional Budget Office projected that the bill would cut Medicaid spending by $834 billion over 10 years and reduce enrollment by 14 million people. "That's absolute nonsense," said Ron Pollack, chairman emeritus of Families USA, who helped build support for passage of the ACA in 2010. "He appears to have no misgivings about saying things that are blatantly untrue. That is an extraordinary thing for an HHS secretary." "He's flacking for an administration that wants to cut people off the healthcare rolls," said Kline, the cancer survivor and a former Democratic campaign staffer. "Physicians should be helping people, not becoming spin doctors." Healthcare industry leaders will be watching closely to see how Price and Seema Verma, the new CMS administrator, proceed in handling payment and delivery reforms launched by the Center for Medicare and Medicaid Innovation. 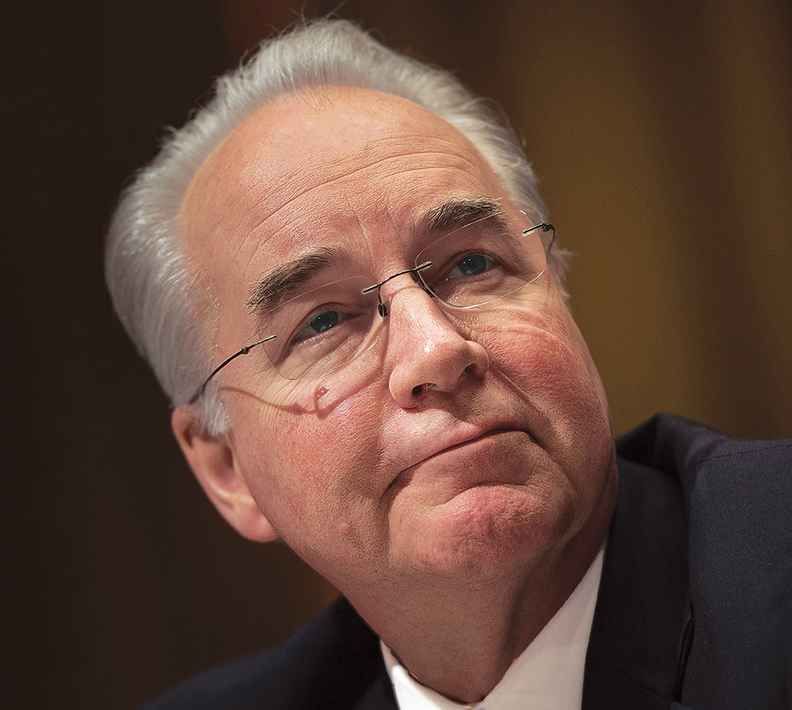 As a congressman, Price was sharply critical of some of CMMI's Medicare demonstrations, particularly the mandatory bundled-payment program for joint replacements that the CMS rolled out in 67 markets last year. In March, the CMS delayed implementation of a mandatory bundled-payment program for cardiac care, suggesting it was mulling whether to further delay or drop all mandatory bundled-payment initiatives. The move raised questions about whether the CMS would continue to lead the nation's value-based payment reform efforts. "Price has always been concerned about some of the bundles," Scully said. "But I hope value-based payment speeds up. My guess is he'll move in that direction because structurally it's the right way to go." "He appears to be allowing the efforts of CMMI to proceed," Mendelson said. "That's different from where he stood in the past, when he was really representing the perspective of physicians. He's now taking a more balanced look." On Medicaid, healthcare executives and state policymakers expect Price and Verma to grant states greater leeway in running their programs, including allowing states to impose premiums, work requirements, benefit cutoffs for premium nonpayment and benefit time limits. Price has long favored converting Medicare into a defined-contribution, premium-support model. Experts doubt, however, that he or congressional Republicans will be able to move forward on that politically, at least this year. But he may try to revamp the program in smaller pieces. Some fret Price will push payment policies that favor certain industry groups, such as medical specialists and drug or equipment manufacturers, or that promote privatization of Medicare. "I'll be watching whether he subverts program integrity," Mendelson said. The more immediate task facing Price is how to keep the individual insurance market functioning in 2018 as a growing number of insurers bow out due to uncertainty about the fate of the ACA and its cost-sharing reduction payments. "As a result of the administration's decisions so far, it's quite likely there will be some regions with no marketplace plans," Mendelson said. Price will "have to figure out how to provide coverage for people in those markets." Whatever he hopes to achieve, Price faces a far rockier political environment than other new HHS secretaries. "Tom Price is a well-liked person who wants to work with people, but he finds himself in an extraordinary time of political upheaval," Pierce said. "The Republican Party has made an inescapable commitment to repeal and replace the ACA. Whether that's right or wrong, he's in this position where that's the order of the day."